Do you like working with your own hands? If your answer – yes then this article is exactly for you. There is a list of the best welding certification schools in Kentucky. Also, you can get some more info about this career. 4 Where Can Certified Welders Work in Kentucky? Welders should have a number of skills and knowledge so they can connect metal pieces together. If you want to do it properly, you need to use a variety of tools that heat and melt metal so it can be connected. Welding – it’s a rewarding career that you can be totally proud of. Just imagine that the constructions made by your hands will be there all over the city for a long period of time. It’s absolutely amazing, isn’t it? Moreover, you can be sure that you’ll find employment easily. It’s because the career outlook increases constantly according to the U.S. Bureau of Labor Statistics. As the data shows the number of offers will grow by 6% by 2026. A median salary of a welder in Kentucky is just a little higher than a median salary throughout the country. It’s $39 540 per year ($19.01 per hour) in Kentucky while throughout the USA it’s 39 390 per year ($18.94 per hour). At the same time, the top 10% of welders in Kentucky earn slightly less than the top 10% welders throughout the USA. They have $57 120 annually and the best welders throughout the country earn $62 100 per year. Where Can Certified Welders Work in Kentucky? 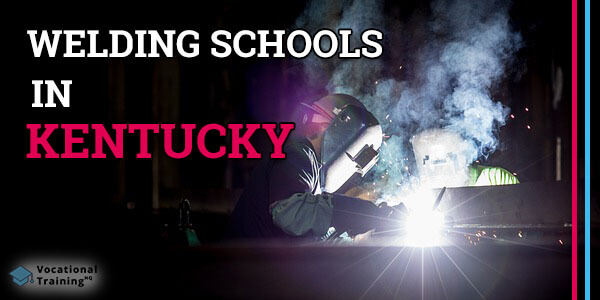 There are lots of schools that provide welding training programs in Kentucky. You should know that all schools presented below are certified by the American Welding Society’s SENSE Accreditation Program. Starting your training, you can be sure that you’ll learn all the important skills such as Gas Tungsten Arc Welding (TIG), Shielded Metal Arc Welding (stick), or Gas Metal Arc Welding (MIG) and others. If you want to enroll in one of the programs, you need to have a high-school diploma or GED. Nevertheless, sometimes high-school juniors have an opportunity to start their welding training.